Every operation, at some point, has a critical positioning requirement for their product as it moves along a conveyor system. By orientation, we mean the way the product or load sits on the conveyor, and how the conveyor can present it to various integrated machines. The product may need a specific orientation for labeling, bar code reading, strapping or any of the hundreds of other applications that make your operation successful in tracking your daily production schedule. 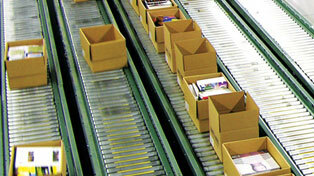 Conveyor exists, most of the time, to deliver product to a specific point so that a process may occur. The way it does that is critical to success. Every application is specific to your needs and above is only a general listing of typical applications and solutions. Contact us for assistance.